My research group is interested in basic research tailored towards understanding the physics of elastic wave and heat transport in conventional and artificial materials. Towards this goal, our group has and will continue to develop novel optical experimental tools with high spatial and temporal resolution for visualization and characterization of elastic waves and phonons in materials. We hope to leverage basic research in these areas to realize new engineering tools that leverage light-matter interaction for applications in, thermal management, reconfigurable elastic waveguides and filters, remote sensors and actuators, super-resolution imaging, and laser-assisted materials processing. Prof. Balogun teaches undergraduate level courses EA-206-2: Engineering Analysis: Statics and Dynamics, and ME 363: Mechanical Engineering. EA-206-2 provides freshman level undergraduates with a solid background in the application of Newton’s laws to engineering problem solving. ME 363 provides students with a strong background in modeling and interpretation of oscillatory motion in mechanical systems, based on physics based analysis approaches. 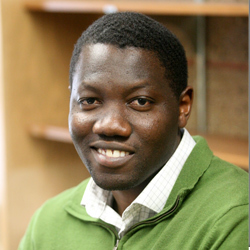 Prof. Balogun also teaches a graduate level course, ME 495: Dynamic deformation of materials. The course focuses on aspects of wave motion in solids including, linear and nonlinear elastic deformation, fracture, and diffraction, induced by dynamic mechanical loading. Specific examples from metals, polymers and composites are provided. The course also surveys available experimental techniques for understanding dynamic deformation in materials.